Health Economist Jonathan Skinner gave a talk at IHME about a week and a half ago. He told us about his work on the Dartmouth Atlas of Healthcare, and showed us some of the numbers he’s crunched on the variation of Medicare costs by region. He has found this mysterious, 2.5x variation between the cost of care between expensive regions (like Miami) and inexpensive regions (like Seattle). It seems like a great mystery, and I’ve been puzzling over it for a week now. Any theories? I’m partial to network effects. Here’s his paper on the subject. At a first sight, there seems to be a relation between the cost and the locations that are favored by retirees. what is end of life care intensity? two possible theories: one is that they might not have properly controlled for variations in the amount of medical care provided. i’d guess the average age of people in Miami area is much more than those in Seattle, and so on average they might require more care even for the same procedure. even if the study controls for the age of the patient who receives the medical care, it might still be the case that since price differentiation is sometimes hard, younger patients in Miami might be subsidizing older patients. a second theory is that perhaps the supply of medical care in places like Seattle which are more desirable for younger people and are also close to good medical schools is higher. add to that the fact that the demand for medical care is certainly higher in places like Miami. Anonymous: An interesting theory, and one that I spend way too much time playing around with today. The survey results by Barnato et al doesn’t seem to have included questions on religiosity, so I don’t think we can test it out directly. But, partially to test out a new web-based visualization platform, I did plot log(ICU spending) versus religious adherence per 1000 on a state-by-state basis. It does not support this hypothesis, but it certainly doesn’t rule it out. Rubens: Weird, huh? Because that is the opposite of the correlation I would have guessed; it seems like more retirees means the health system deals with a greater proportion of EOL care means that spending should be lower because of economies of scale. Mohammad: I think that “end of life care intensity” is roughly the amount of resources devoted to a patient near the end of their life. In the paper above, the authors use average number of dollars that medicare spends on a patient in the six months before their death. I think that the authors focus on EOL spending to mitigate the sort of confounding effects you have identified. For example, a hospital that treats really ill patients might be spending more and getting worse outcomes than a hospital that treats not-so-ill patients, but maybe they should be spending more, since they have tougher cases to deal with, and maybe they can’t expect the same quality of outcomes because some of the people coming in a so sick that there isn’t much to be done. EOL care partially addresses this, because maybe the patients are coming in older and sicker in some places than in others, but 6 months later they are just as dead. There are tons of interesting thoughts in the article, which is a great read, as well as insightful. Here I’ll just piece together the high-level flow of the argument around the structure of doctor’s organizations within a locale. 1) The most expensive areas of the country for Medicare are 2-3 times the cost of the least expensive. If these most expensive areas could be changed to cost the same as the average areas, most of the expense problems of Medicare could be solved. 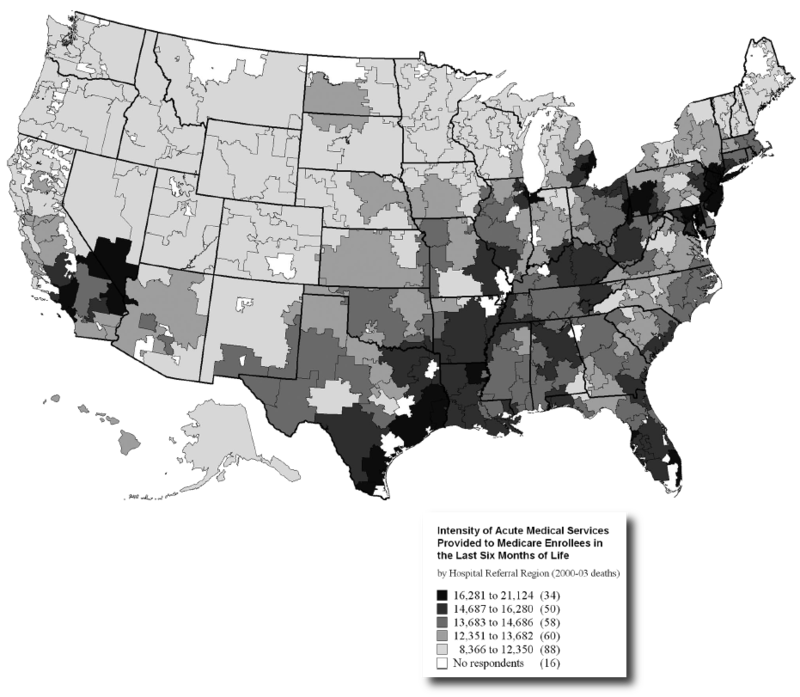 2) The most expensive areas of the country do NOT get better health outcomes than the less expensive areas. They do provide substantially more “services” — hospitalizations, tests, surgeries, etc. — but patients don’t have live longer, aren’t healthier, and aren’t happier with the results. 3) By comparing expensive locales with less expensive locales, we can rule out most of the obvious causes of the difference. The expensive locales are very similar in types of patients, the problems those patients have, the training their doctors received, etc. 4) One key difference is that in the LESS expensive locales the doctors have organized themselves to create a medical system that changes substantially the motivations. Doctors are evaluated on long-term patient outcomes, and cannot make themselves richer by performing additional procedures on patients. The doctors work together collaboratively to learn how to better serve patients. The explanation that I love is the “network effects”. Gawande touches on with the anchor-tenant phenomenon. But I think this only scratches the surface. The network-effects story is this: in situations where treatment is unclear, doctors do what their friends do. So doctors who associate with doctors who overtest are themselves overtesters. I think there should be some hard data on this soon, maybe from a CDC social network survey.